Federal regulators today approved an operating license for TVA's Watts Bar Unit 2, allowing the first new American nuclear plant to begin operation in nearly two decades. The U.S. Nuclear Regulatory Commission today approved an operating license for the second reactor at Watts Bar, nearly 43 years after the regulatory agency first granted a construction permit for work to begin on the nuclear plant near Spring City, Tenn. 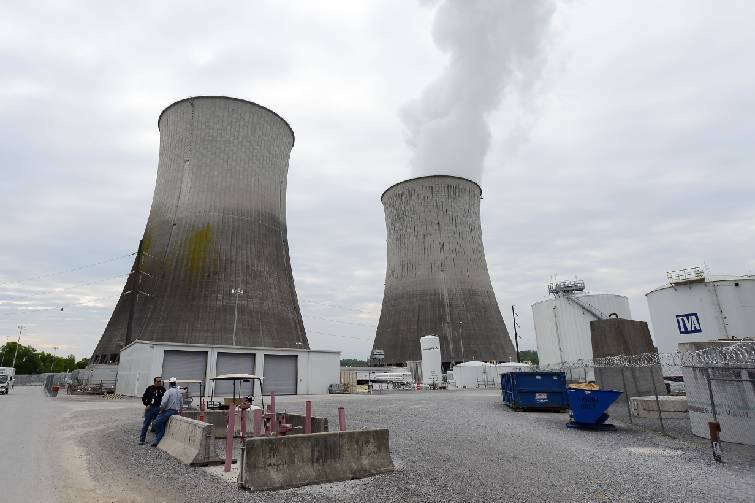 The license allows TVA to load nuclear fuel into the new unit and begin testing of the equipment and likely produce power by the end of the year. Cooling towers for Unit 1, right, and Unit 2, left, are shown at the Watts Bar Nuclear Plant near Spring City, Tenn., in this April 29, 2015 photo. NRC commissioners this spring authorized William Dean, director of the NRC's Office of Nuclear Reactor Regulation, to grant the operating license once TVA met all of its regulatory requirements. The last nuclear unit to get an operating license in the United States was Watts Bar Unit 1 in February 1996. "This achievement signifies more than a stage in construction for TVA," President and CEO Bill Johnson said. "It demonstrates to the people of the Valley that we have taken every step possible to deliver low cost, carbon-free electricity safely and with the highest quality." Construction of both units at Watts Bar began in January 1973, but work was suspended in 1988 when TVA halted its entire nuclear program due to safety concerns. Watts Bar Unit 1 was finished and licensed in 1996, and work on Watts Bar Unit 2 was restarted in 2007. The initial $2.5 billion restart project for the Unit 2 reactor has ended up taking nearly three years longer and nearly $2 billion more to finish. But TVA said this summer its work on Unit 2 was substantially completed, and the revised schedule adopted two years ago was completed on time and within budget. NRC said there have been 64 inspections of the plant during construction and regulators will continue to monitor the startup of the unit in coming months. In a letter to TVA last week, NRC's acting regional administrator, Leonard Wert, said inspectors over the past eight years have checked and verified 560 items identified as necessary for the start-up of Unit 2 at Watts Bar.